N. Alhassoun, M. Y. S. Uddin, and N. Venkatasubramanian. "Context-Aware Energy Optimization for Perpetual IoT-Based Safe Communities". Sustainable Computing: Informatics and Systems, (SUSCOM, 2019). Mahmudur Rahman, Amatur Rahman, Hua-Jun Hong, Li-Wen Pan, Md Yusuf Sarwar Uddin, Nalini Venkatasubramanian, Cheng-Hsin Hsu. An adaptive IoT platform on budgeted 3G data plans, accepted in Elsevier Journal of Systems Architecture. Praveen Venkateswaran, Mahima Agumbe Suresh, Nalini Venkatasubramanian, Augmenting In-situ with Mobile Sensing for Adaptive Monitoring of Water Distribution Networks, in Proceedings of the 10th ACM/IEEE International Conference on Cyber-Physical Systems (ICCPS), 2019. N. Panwar, S. Sharma, G. Wang, S. Mehrotra, and N. Venkatasubramanian, "Verifiable Round-Robin Scheme for Smart Homes". in the 9th ACM Conference on Data and Application Security and Privacy, CODASPY 2019, Dallas, TX, USA, March 25-27, 2019. ACM 2019. Kyle E. Benson, Georgios Bouloukakis, Casey Grant, Valérie Issarny, Sharad Mehrotra, Ioannis Moscholios, Nalini Venkatasubramanian. "FireDeX: a Prioritized IoT Data Exchange Middleware for Emergency Response". in Proceedings of 19th International Middleware Conference (Middleware ’18). 2018. M. Y. S. Uddin, and N. Venkatasubramanian. "Edge Caching for Enriched Notifications Delivery in Big Active Data". in 38th IEEE International Conference on Distributed Computing Systems (ICDCS), 2018. Q. Zhu, M. Y. S. Uddin, N. Venkatasubramanian, C. Hsu, and H. Hong. "Poster Abstract: Enhancing Reliability of Community Internet-of-Things Deployments with Mobility". in IEEE INFOCOM WKSHPS 2018-IEEE Conference on Computer Communications Workshops, 2018. Praveen Venkateswaran, Qing Han, Ronald Eguchi, and Nalini Venkatasubramanian. "Impact Driven Sensor Placement for Leak Detection in Community Water Networks". in Proceedings of the 9th ACM/IEEE International Conference on Cyber-Physical Systems (ICCPS), 2018. Mahmudur Rahman Hera, Amatur Rahman, Afia Afrin, Hua-Jun Hong, Pei-Hsuan Tsai, Md Yusuf Sarwar Uddin, Nalini Venkatasubramanian, and Cheng-Hsin Hsu. "Adaptive Sensing Using Internet-of-Things with Constrained Communications". Workshop on Adaptive and Reflective Middleware (ARM), co-located with ACM/IFIP/USENIX Middleware, Dec 11-15, 2017, Las Vegas. Hua-Jun Hong, Pei-Hsuan Tsai, An-Chieh Cheng, Md Yusuf Sarwar Uddin, Nalini Venkatasubramanian, and Cheng-Hsin Hsu. "Supporting Internet-of-Things Analytics in a Fog Computing Platform". 9th IEEE International Conference on Cloud Computing Technology and Science (CloudCom 2017), Dec 11-14, 2017, Hong Kong. Q. Zhu, M. Y. S. Uddin, Z. Qin, and N. Venkatasubramanian. "Data Collection and Upload under Dynamicity in Smart Community Internet-of-Things Deployments". Pervasive and Mobile Computing (2017), https://doi.org/10.1016/j.pmcj.2017.10.003. Eun-Jeong Shin, Roberto Yus, Sharad Mehrotra, and Nalini Venkatasubramanian. "Exploring Fairness in Participatory Thermal Comfort Control in Smart Buildings". in 4th ACM International Conference on Systems for Energy-Efficient Built Environments (BuildSys 2017), Delft (The Netherlands), 2017, pp. 10. Nailah Alhassoun, Md Yusuf Sarwar Uddin, and Nalini Venkatasubramanian. "SAFER: An IoT-Based Perpetual Safe Community Awareness and Alerting Network". in 2017 Eighth International Green and Sustainable Computing Conference (IGSC). Steven Jacobs, Md Yusuf Sarwar Uddin, Michael Carey, Vagelis Hristidis, Vassilis Tsotras, Nalini Venkatasubramanian, Yao Wu, Syed Safir, Purvi Kaul, Xikui Wang, Mohiuddin Qader, Yawei Li "A BAD Demonstration: Towards Big Active Data" (DEMO Paper). in Proceedings of the VLDB Endowment (2017). "Towards Situational Awareness on Big Data: A BAD Approach". in International Workshop on Real-time Analytics in Multi-latency, Multi-Party, Metro-scale Networks, Sponsored and Held in conjunction with ICDE 2017. Michael Dunaway, Robin Murphy, Nalini Venkatasubramanian, Leysia Palen, Daniel Lopresti. "Research Agenda in Intelligent Infrastructure to Enhance Disaster Management, Community Resilience and Public Safety". Computing Community Consortium (CCC) white paper. N. Do, Y. Zhao, C. Hsu; N. Venkatasubramanian. "Crowdsourced Mobile Data Transfer with Delay Bound". ACM Trans. Internet Technol. 1, 1, Article 1 (May 2015), 29 pages. D. Wu, Q. Liu, Y. Li, J. A. McCann, A. C. Regan, N. Venkatasubramanian. "Adaptive Lookup of Open WiFi Using Crowdsensing". in IEEE/ACM Transactions on Networking , vol. PP, no. 99, pp. 1-14. D. Wu, D. I. Arkhipov, M. Kim, C. L. Talcott, A. C. Regan, J. A. McCann, N. Venkatasubramanian. "ADDSEN: Adaptive Data Processing and Dissemination for Drone Swarms in Urban Sensing". in IEEE Transactions on Computers , vol. PP, no. 99, pp. 1-1. S. Mehrotra, A. Kobsa, N. Venkatasubramanian, S. R. Rajagopalan. "TIPPERS: A Privacy Cognizant IoT Environment". in First IEEE International Workshop on Security, Privacy and Trust for IoT, Sydney, Australia. 2016. M. Y. S. Uddin, A. Nelson, K. Benson, G. Wang, Q. Zhu, Q. Han, N. Alhassoun, P. Chakravarthi, J. Stamatakis, D. Hoffman, S. Almomen, L. DArcy, and N. Venkatasubramanian. "The SCALE2 Multi-network Architecture for IoT-based Resilient Communities". in 2016 IEEE International Conference on Smart Computing (SMARTCOMP), 2016, pp. 1-8. Q. Zhu, M. Y. S. Uddin, Z. Qin, and N. Venkatasubramanian. "Upload Planning for Mobile Data Collection in Smart Community Internet-of-Things Deployments". in 2016 IEEE International Conference on Smart Computing (SMARTCOMP), 2016, pp. 1-8. K. E. Benson, Q. Han, K. Kim, P. Nguyenm, and N. Venkatasubramanian. " Resilient Overlays for IoT-based Community Infrastructure Communications". in 2016 IEEE First International Conference on Internet-of-Things Design and Implementation (IoTDI), 2016, pp. 152-163. Md Yusuf Sarwar Uddin, Vinay Setty, Ye Zhao, Roman Vitenberg, Nalini Venkatasubramanian. "RichNote: Adaptive Selection and Delivery of Rich Media Notifications to Mobile Users". IEEE International Conference on Distributed Computing Systems (ICDCS 2016), June 27-30, 2016. Kyle Benson, Charles Fracchia, Guoxi Wang, Qiuxi Zhu, Serene Almomen, John Cohn, Luke D’Arcy, Daniel Hoffman, Matthew Makai, Julien Stamatakis, and Nalini Venkatasubramanian. " SCALE: Safe Community Awareness and Alerting Leveraging the Internet of Things". IEEE Communications, December 2015. Grant et al. "Research Roadmap for Smart Fire Fighting". National Institute of Standards and Technology (NIST) Special Publication 1191, May 2015. S.Sarma, N.Venkatasubramanian, and N. Dutt. "Sense-making from Distributed and Mobile Sensing Data: A Middleware Perspective". Proceedings of the 51st Design Automation Conference (DAC’14), SF, CA, June 2014. K. Nakayama, N. Dang, L. Bic, M. Dillencourt, E. Bozorgzadeh, N. Venkatasubramanian. "Distributed Flow Optimization Control for Energy-Harvesting Wireless Sensor Networks". IEEE International Conference on Communications (ICC), June 2014. Zhijing Qin, Ngoc Do, Grit Denker, Nalini Venkatasubramanian. "Software-Defined Cyber-Physical Multinetworks ". Invited Paper, to appear in International Conference on Computing, Networking and Communications (ICNC) 2014. Zhijing Qin, Qi Han, Sharad Mohrotra and Nalini Venkatasubramanian. "Quality-Aware Sensor Data Management". Book Chapter, "The art of Wireless Sensor Networks", Pages 429-464 Editor Habib Habib M. Ammari et. al. Publisher: Springer Berlin Heidelberg, 2014. M. Reza. Rahimi, Nalini Venkatasubramanian, Athanasios Vasilakos. "MuSIC: On Mobility-Aware Optimal Service Allocation in Mobile Cloud Computing". In the IEEE 6th International Conference on Cloud Computing, (Cloud 2013), July 2013, Silicon Valley, CA, USA. Kyle E. Benson and Nalini Venkatasubramanian. "Improving Sensor Data Delivery During Disaster Scenarios with Resilient Overlay Networks". in proceedings of Third International Workshop on Pervasive Networks for Emergency Management 2013 (PerNEM 2013), 2013. Zhijing Qin, Ye Zhao, Nalini Venkatasubramanian. "Modeling Path Duration Time in Dynamic Convergecast Network". In the proceedings of IEEE Wireless Communications and Networking Conference (WCNC), 2013. Kyle Benson. Improving Sensor Data Delivery During Disaster Scenarios with Resilient Overlay Networks. Work in progress talk. In the 2nd ACM International Conference on High Confidence Networked Systems (HiCoNS), as part of Cyber Physical Systems (CPS) Week 2013. Zhijing Qin, Grit Denker, Nalini Venkatasubramanian, Carolyn Talcott. "Achieving Resilience of Heterogeneous Networks Through Predictive, Formal Analysis". In the 2nd ACM International Conference on High Confidence Networked Systems (HiCoNS), as part of Cyber Physical Systems (CPS) Week 2013. Ngoc Do, Cheng-hsin Hsu, Nalini Venkatasubramanian. "Video Streaming over Hybrid Cellular and Ad Hoc Networks". IEEE Transactions on Mobile Computing, 2012. Mayur Deshpande, Kyungbaek Kim, Bijit Hore, Sharad Mehrotra, Nalini Venkatasubramanian. "ReCREW: A Reliable Flash Dissemination System". IEEE Transactions on Computers, 2012. Nga Dang, Elaheh Bozorgzadeh, Nalini Venkatasubramanian. "QuARES:Quality-aware Renewable Energy-driven Sensing Framework". Sustainable Computing: Informatics and Systems, Volume 2, Issue 4, December 2012, Pages 171-183. Nga Dang, Elaheh Bozorgzadeh, Nalini Venkatasubramanian. "Energy Harvesting for Sustainable Smart Spaces". Advances in Computer, Elsevier, 2012. Grit Denker, Nikil Dutt, Sharad Mehrotra, Mark-Oliver Stehr, Carolyn Talcott, Nalini Venkatasubramanian. "Resilient, Dependable CyberPhysical Systems: A Middleware Perspective. Journal of Internet Systems and Applications"; invited papers from the Future of Middleware Event (FOME 2012) held in conjunction with ACM/IFIP/USENIX Middleware 2012. Santanu Sarma, Nikil Dutt, and Nalini Venkatasubramanian. "Cross-Layer Virtual Observers for Embedded Multiprocessor System-On-Chip (MPSoC) ". ARM 2012 to be held in conjunction with ACM Middleware 2012. Grit Denker, Zhijing Qin, Daniel Elenius, Carolyn Talcott and Nalini Venkatasubramanian. "Fault Analysis and Design Trade-Offs In Networked Cyber Physical Systems: A Formal Method-Based Approach". Position paper in 1st International Workshop on Reliable CyberPhysical Systems (WRCPS) 2012 held in conjunction with SRDS 2012. M. Reza. Rahimi, Nalini Venkatasubramanian, Sharad Mehrotra and Athanasios Vasilakos. "MAPCloud: Mobile Applications on an Elastic and Scalable 2-Tier Cloud Architecture". IEEE/ACM UCC, 2012. M. Reza. Rahimi, Nalini Venkatasubramania. "Exploiting an Elastic 2-Tiered Cloud Architecture for Rich Mobile Applications". poster IEEE/ACM WoWMoM, 2012. Ngoc Do, Cheng-hsin Hsu, Nalini Venkatasubramanian. "CrowdMAC: A Crowdsourcing System for Mobile Access". ACM/IFIP/USENIX Middleware 2012. Ngoc Do, Cheng-hsin Hsu, Nalini Venkatasubramanian. "HybCast: Efficient Rich Content Dissemination over Hybrid Cellular and Ad Hoc Networks". IEEE SRDS 2012. Ngoc Do, Nalini Venkatasubramanian. "Rich Content Sharing in Mobile Systems using Multiple Wireless Networks". ACM MDS 2012. Mamadou H. Diallo, Bijit Hore, Chang Ee-Chien, Sharad Mehrotra, Nalini Venkatasubramanian. "CloudProtect: Managing Data Privacy in Cloud Applications". IEEE Cloud 2012. Leila Jalali, Carolyn Talcott, Sharad Mehrotra, Nalini Venkatasubramanian. "Formal Specification of Multisimulation using Maude". MS/DEVS: Theory of Modeling and Simulation (formerly known as the DEVS Integrative M&S), 2012. Kyungbaek Kim, Ye Zhao, Nalini Venkatasubramanian. "GSFord: Towards a Reliable Geo-Social Notification System". IEEE SRDS 2012. Leila Jalali, Sharad Mehrotra, Nalini Venkatasubramanian. "Multisimulations: Towards Next Generation Integrated Simulation Environments". Formal Modeling: Actors, Open Systems, Biological Systems 2011, pp. 252-267. Jinsu Wang, Kyungbaek Kim, Sharad Mehrotra, Nalini Venkatasubramanian. "Enhancing Cellular Infrastructures: A Reflective Approach". ARM 2011 to be held in conjunction with ACM Middleware 2011. Kyougwoo Lee, Aviral Srivastava, Nikil Dutt and Nalini Venkatasubramanian. "Error Aware Video Encoding for Energy/QoS Tradeoffs". IEEE Transactions on Embedded Computing Systems, 2010. Leila Jalali, Sharad Mehrotra, Nalini Venkatasubramanian. "Interoperability of Multiple Autonomous Simulators in Integrated Simulation Environments". SISO Spring SIW’11, April 2011. Ngoc Do, Cheng-hsin Hsu, Jaatinder Pal Singh, and Nalini Venkatasubramanian. "Massive Live Video Distribution using Hybrid Cellular and Ad Hoc Networks". In the Proceedings of Wowmom 2011. Haiyang Ma, Deepak Gangadharan, Nalini Venkatasubramanian, Roger Zimmerman. "Energy-Aware Complexity Adaptation for Mobile Video Calls". In ACM Multimedia 2011. Sharad Mehrotra, Nalini Venkatasubramanian, Mark-Oliver Stehr, Carolyn Talcott. "Pervasive Sensing, Event Detection and Situational Awareness". In "Securing Cyber-Physical Infrastructures: Foundations and Challenges", eds. Sajal Das, Krishna Kant, Nan Zhang, 2011. Sebastian Gutierrez-Nolasco, Nalini Venkatasubramanian, Carolyn Talcott and Mark-Oliver Stehr. "Tailoring Group Membership Consistency for Mobile Networks". IEEE 2011 International Conference on Collaboration Technologies and Systems (CTS 2011), May 2011. M. Reza. Rahimi, Nalini Venkatasubramania. "Cloud Based Framework for Rich Content Mobile Applications". poster in the IEEE/ACM 11th International Symposium on Cluster, Cloud and Grid Computing (CCGRID2011), Newport Beach, May 2011, USA ( Best Student Poster Award ). Shivajit Mohapatra, M. Reza. Rahimi, Nalini Venkatasubranian. "Power-Aware Middleware for Mobile Applications. Chapter 10 of the Handbook of Energy-Aware and Green Computing, ISBN: 978-1-4398-5040-4, Chapman & Hall/CRC, 2011. Nga Dang, Eli Bozorgradeh, Nalini Venkatasubramanian. "QuARES : Quality-Aware Data Collection in Energy Harvesting Systems". in International Green Computing Conference (IGCC’11), Orlando, Florida 25-28th July 2011. Hojjat Jafarpour, Bijit Hore, Sharad Mehrotra, Nalini Venkatasubramanian. "CCD : A Distributed Publish/Subscribe Framework for Rich Content Formats". IEEE Transactions on Parallel and Distributed Systems, 2011. Ngoc Do, Chenghsin Hsu, Xin, Nalini Venkatasubramanian. "An Experimental Study on Scalable Video Streaming over Hybrid Cellular AdHoc Networks". ACM/IFIP/USEMIX International Middleware Conference, 2011. Minyoung Kim, Mark-Oliver Stehr, Carolyn Talcott, Nikil Dutt, Nalini Venkatasubramanian. "A Formal Methodology for Compositional Cross-Layer Optimization". FHCT, Lecture Notes in Computer Science, Springer-Verlag, 2011. Leila Jalali, Sharad Mehrotra, NaliniVenkatasubramanian. "Integrated Simulation Environments for Emergency Response", Poster in Southern California Smart Grid Research Symposium, Oct. 2010. Bijit Hore, Jehan Wickramasuriya, Sharad Mehrotra, Nalini Venkatasubramanian, Daniel Massaguer. Privacy-Preserving Event Detection for Pervasive Spaces. IEEE Pervasive Computing and Communications (Percom 2009), March 2009, Galveston, Texas, USA. Bo Xing, Karim Seada and Nalini Venkatasubramanian. Proximiter: Enabling Mobile Proximity-Based Content Sharing on Portable Devices. (Demo Paper)The 7th IEEE International Conference on Pervasive Computing and Communications (PerCom 2009). March 2009. Galveston, Texas USA. Bo Xing, Karim Seada, Peter Boda and Nalini Venkatasubramanian. PassItOn: An Opportunistic Messaging Prototype on Mobile Devices. (Demo Paper) The 6th Annual IEEE Consumer Communications & Networking Conference (CCNC 2009). January 2009. Las Vegas, Nevada USA. Hojjat Jafarpour, Sharad Mehrotra and Nalini Venkatasubramanian. A Fast and Robust Content-based Publish/Subscribe Architecture. IEEE NCA 2008, Boston, MA. Minyoung Kim, Sudarshan Banerjee, Nikil Dutt, Nalini Venkatasubramanian. Energy-aware Cosynthesis of Real-time Multimedia Applications on MPSoCs Using Heterogeneous Scheduling Policies. ACM Transactions on Embedded Computing Systems (TECS). 7(2): Article 9, 2008. Minyoung Kim, Nikil Dutt, Nalini Venkatasubramanian, Carolyn Talcott. xTune: Online Verifiable Cross-Layer Adaptation for Distributed Real-Time Embedded Systems. SIGBED Review, Volume 5, Number 1, January 2008. Special Issue on the RTSS Forum on Deeply Embedded Real-Time Computing. Best Overall Idea Award & Best System Architecture Award. Kyoungwoo Lee, Aviral Shrivastava, Nikil Dutt and Nalini Venkatasubramanian. Data Partitioning Techniques for Partially Protected Caches to Reduce Soft Error Induced Failures. IFIP Working Conference on Distributed and Parallel Embedded Systems (DIPES 08), Sep. 2008. Kyoungwoo Lee, Minyoung Kim, Nikil Dutt, Nalini Venkatasubramanian. Error-Exploiting Video Encoder to Extend Energy/QoS Tradeoffs for Mobile Embedded Systems. IFIP Working Conference on Distributed and Parallel Embedded Systems (DIPES’08), Sep. 2008, Milano, Italy. Minyoung Kim, Daniel Massaguer, Nikil Dutt, Sharad Mehrotra, Shangping Ren, Mark-Oliver Stehr, Carolyn Talcott, Nalini Venkatasubramanian. A Semantic Framework for Reconfiguration of Instrumented Cyber Physical Spaces. Second Workshop on Event-based Semantics (WEBS’08) in conjunction with IEEE Real-Time and Embedded Technology and Applications Symposium (RTAS’08) in part of CPSWEEK, Apr. 2008, St. Louis, MO, USA. Yun Huang and Nalini Venkatasubramanian. Mobile Data Overlay (MDO): A Data Placement Paradigm for Mobile Applications. The 9th International Conference on Mobile Data Management (MDM’08), Beijing, China. Minyoung Kim, Mark-Oliver Stehr, Carolyn Talcott, Nikil Dutt, Nalini Venkatasubramanian. Constraint Refinement for Online Verifiable Cross-Layer System Adaptation. IEEE/ACM Design Automation and Test in Europe (DATE ‘08), Mar. 2008, Munich, Germany. Liang Cheng, Shivajit Mohapatra, Magda El Zarki, Nikil Dutt, Nalini Venkatasubramanian. Quality Based Backlight Optimization for Video Playback on Handheld Devices. Journal on Advances in Multimedia, Special issue on Cross-layer Optimized Wireless Multimedia Communications, July 2007. Shivajit Mohapatra, Nikil Dutt, Alex Nicolau, Nalini Venkatasubramanian. DYNAMO: A Cross-Layer Framework for End-to-End QoS and Energy Optimization in Mobile Handheld Devices. IEEE Journal on Selected Areas in Communication, Vol. 25, No. 4, May 2007. Qi Han,Sharad Mehrotra and Nalini Venkatasubramanian. Application-aware Integration of Data Collection and Power Management in Wireless Sensor Networks. Journal of Parallel and Distributed Computing (JPDC), Vol. 67, No. 9, September 2007, Pages 992-1006. Qi Han and Nalini Venkatasubramanian. Timeliness-Accuracy Balanced Collection of Dynamic Data. IEEE Transactions on Parallel and Distributed Systems (TPDS), Vol. 18, No.2, February 2007. Qi Han and Nalini Venkatasubramanian. Information Collection Services for QoS-aware Mobile Applications. IEEE Transactions on Mobile Computing (TMC), Vol.5, No.5, May 2007. Minyoung Kim, Mark-Oliver Stehr, Carolyn Talcott, Nikil Dutt, Nalini Venkatasubramanian. Combining Formal Verification with Observed System Execution Behavior to Tune System Parameters. International Conference on Formal Modelling and Analysis of Timed Systems (FORMATS’07) in part of ESWEEK, Oct. 2007, Salzburg, Austria., LNCS 4763 (pp. 257 - 273) . Minyoung Kim, Mark-Oliver Stehr, Carolyn Talcott, Nikil Dutt, Nalini Venkatasubramanian. A Probabilistic Formal Approach to Cross-layer Optimization in Distributed Embedded Systems. IFIP Conference on Formal Methods for Open Object-Based Distributed Systems (FMOODS’07), Jun. 2007, Paphos, Cyprus., LNCS 4468 (pp. 285 - 300). Mayur Deshpande, Abhishek Amit, Mason Chang, Nalini Venkatasubramanian and Sharad Mehrotra. Flashback: A Peer-to-Peer Webserver for Handling Flash Crowds. IEEE International Conference on Distributed Computing Systems (ICDCS). 2007. Bijit Hore, Hojjat Jafarpour, Ramesh Jain, Shengyue Ji, Daniel Massaguer, Sharad Mehrotra, Nalini Venkatasubramanian, and Utz Westermann. Design and Implementation of a Middleware for Sentient Spaces. ISI 2007, 2007-05. Yun Huang and Nalini Venkatasubramanian. Supporting Mobile Multimedia Applications in MAPGrid. ACM International Wireless Communications and Mobile Computing Conference 2007, Honolulu, Hawaii. Yun Huang and Nalini Venkatasubramanian. Empowering Multimedia Applications in MAPGrid. IEEE CCGrid Poster Paper, CCGrid 2007, Rio de Janeiro, Brazil. Yun Huang, Nalini Venkatasubramanian and Yang Wang. MAPGrid: A New Architecture for Empowering Mobile Data Placement in Grid Environments. IEEE CCGrid Workshop on Context-Awareness and Mobility in Grid Computing, CCGrid 2007, Rio de Janeiro, Brazil. Bo Xing, Mayur Deshpande, Nalini Venkatasubramanian and Sharad Mehrotra. Towards Reliable Application Data Broadcast in Wireless Ad Hoc Networks. In proceedings of IEEE Wireless Communications and Networking Conference 2007 (WCNC2007). 11-15 March 2007. Hong Kong, China. Iosif Lazaridis, Qi Han, Sharad Mehrotra, Nalini Venkatasubramanian. Fault-Tolerant Queries over Sensor Data. The 13th International Conference on Management of Data (COMAD), Delhi, India, December 2006. Yun Huang, Shivajit Mohapatra, Qi Han, Nalini Venkatasubramanian. QoS Aware Resource Discovery in Mobile Environments. chapter VI of the book on "Mobile Middleware", Chapman and Hall/CRC Press, 2006. Minyoung Kim, Hyunok Oh, Nikil Dutt, Alex Nicolau, Nalini Venkatasubramanian. PBPAIR: An Energy-efficient Error-resilient Encoding Using Probability Based Power Aware Intra Refresh. ACM SIGMOBILE Mob. Comput. Commun. Rev. 10(3): 58-69, 2006. S. Gutierrez-Nolasco, N. Venkatasubramanian, M.-O. Stehr and C. Talcott. Towards Adaptive Secure Group Communication: Bridging the Gap between Formal Specification and Network Simulation. In proceeddings of the 12th IEEE International Symposium on Pacific Rim Dependable Computing (PRDC’06). December, 2006. Mayur Deshpande, Nalini Venkatasubramanian And Sharad Mehrotra. Heuristics for Flash-Dissemination in Heterogenous Networks. IEEE International Conference on High Performance Computing (HiPC). 2006. Kyoungwoo Lee, Aviral Shrivastava, Ilya Issenin, Nikil Dutt and Nalini Venkatasubramanian. Mitigating Soft Error Failures for Multimedia Applications by Selective Data Protection. International Conference on Compilers, Architectures and Synthesis for Embedded Systems (CASES 06), pages 411-420, Oct. 2006. Minyoung Kim, Sudarshan Banerjee, Nikil Dutt, Nalini Venkatasubramanian. Design Space Exploration of Real-time Multi-media MPSoCs with Heterogeneous Scheduling Policies. IEEE/ACM/IFIP Conference on Hardware/Software Codesign and System Synthesis (CODES-ISSS’06), Oct. 2006, Seoul, South Korea. Mayur Deshpande, Bo Xing, Iosif Lazardis, Bijit Hore, Nalini Venkatasubramanian And Sharad Mehrotra. CREW: A Gossip-based Flash-Dissemination System. IEEE International Conference on Distributed Computing Systems (ICDCS). 2006. Minyoung Kim, Nikil Dutt, Nalini Venkatasubramanian. Policy Construction and Validation for Energy Minimization in Cross Layered Systems: A Formal Method Approach. IEEE Real-Time and Embedded Technology and Applications Symposium (RTAS’06) Work-in-Progress Session Apr. 2006, San Jose, CA, USA. Daniel Massaguer, Vidhya Balasubramanian, Sharad Mehrotra, Nalini Venkatasubramanian. Synthetic Humans in Emergency Response Drills. Demo Paper, In Proceedings of Fifth International Joint Conference on Autonomous Agents and Multiagent Systems (AAMAS 2006), Future University-Hakodate, Japan, 8 - 12 May 2006. Daniel Massaguer, Vidhya Balasubramanian, Sharad Mehrotra, Nalini Venkatasubramanian. Multi-Agent Simulation of Disaster Response. In Proceedings of First International Workshop on Agent Technology for Disaster Management (ATDM) held at Fifth International Joint Conference on Autonomous Agents and Multiagent Systems (AAMAS 2006), Future University-Hakodate, Japan, 8 - 12 May 2006. Vidhya Balasubramanian, Daniel Massaguer, Sharad Mehrotra, Nalini Venkatasubramanian. DrillSim: A Simulation Framework for Emergency Response Drills. In Proceedings of Intelligence and Security Informatics 2006 (ISI 2006), San Diego, California, May 23 - 24, 2006. Humeyra Topcu Altintas, Yun Huang and Nalini Venkatasubramanian. Overload-Driven Mobility-Aware Cache Management in Wireless Environments. The 3rd Annual International Conference on Mobile and Ubiquitous Systems: Networks and Services (MOBIQUITOUS 2006). S. Gutierrez-Nolasco, N. Venkatasubramanian and C. Talcott. A Semantic Model for Safe Protocol Interaction. In proceedings of the 21st Annual ACM Symposium on Applied Computing (SAC’06). April, 2006. Liang Cheng, Shivajit Mohapatra, Magda El Zarki, Nalini Venkatasubramanian, Nikil Dutt. A Backlight Optimization Scheme for Video Playback on Mobile Devices. IEEE Consumer Communications and Networking Conference, Las Vegas, Jan 8th - 10th, 2006 (Winner of Best Paper Award). Kyoungwoo Lee, Nikil Dutt and Nalini Venkatasubramanian. An Experimental Study on Energy Consumption of Video Encryption for Mobile Handheld Devices. Poster Paper, ICME July 2005. Yun Huang, Shivajit Mohapatra, Qi Han, Nalini Venkatasubramanian. QoS Aware Resource Discovery in Mobile Environments, chapter VI of the book on "Mobile Middleware", Chapman and Hall/CRC Press, 2005. Bo Xing and Nalini Venkatasubramanian. Multi-Constraint Dynamic Access Selection in Always Best Connected Networks. In proceedings of The Second Annual International Conference on Mobile and Ubiquitous Systems: Networking and Services (Mobiquitous 2005), pp. 56 ~ 64, San Diego, 2005. M. Kim, H. Oh, N. Dutt, A. Nicolau and N. Venkatasubramanian. Probability Based Power Aware Error Resilient Coding. First International Workshop on Services and Infrastructures for the Ubiquitous and Mobile Internet (SIUMI’05) in conjunction with ICDCS, Jun. 2005. S. Mohapatra, R. Cornea, H. Oh, K. Lee, M. Kim, N. Dutt, R. Gupta, A. Nicolau, S. Shukla and N. Venkatasubramanian. A Cross-Layer Approach for Power-Performance Optimization in Distributed Mobile Systems. NSF Next Generation Software Program in conjunction with IPDPS, April 2005. Y. Huang, S. Mohapatra and N. Venkatasubramanian. An Energy Efficient Middleware for Supporting Multimedia Services in Mobile Grid Environments. IEEE ITCC. April 2005. L. Cheng, S. Bossi, S. Mohapatra, M. El Zarki, N. Venkatasubramanian and N. Dutt. Quality Adapted Backlight Sealing (QABS) for Video Streaming to Mobile Handheld Devices. IEEE/IEE/LNCS ICN. April 2005. Q. Han, Lazaridis, S. Mehrotra and N. Venkatasubramanian. Sensor Data Collection with Reliability Guarantees. IEEE PerSeNS (in conjunction with PerCom). March 2005. J. Wickramsuriya, M. Alhazzazi, M.Datt, S. Mehrotra and N. Venkatasubramanian. Privacy Preserving Video Surveillance. SPIE International Symposium on Electronic Imaging. January 2005. N. Venkatasubramanian, C. Talcott, G. Agha. A Formal Model for Reasoning about Adaptive QoS-Enabled Middleware. ACM Transactions on Software Engineering and Methodology, Vol. 13, No.1, January 2004. S. Mohapatra, C. Periera, N. Dutt, R. Gupta and N. Venkatasubramanian. Energy-Aware Adaptation for End-to-end Video Streaming to Mobile Handheld Devices. Ultra Low Power Electronics and Design. Chapter 14. Kluwer Academic Publishers, 2004. Z. Fu and N. Venkatasubramanian. An Evaluation of Composite Routing and Scheduling Policies for Dynamic Multimedia Environments. ACM Multimedia Systems Journal, 2004. S. Pasricha, M. Luthra. S. Mohapatra, N. Dutt and N. Venkatasubramanian. Dynamic Backlight Adaptation for Low-Power Handheld Devices. IEEE Design and Test of Computers, Special Issue on Embedded Systems for Real Time Embedded Systems. 2004. J. Wickramasuriya and N. Venkatasubramanian. Dynamic Access Control for Ubiqitous Environments. International Symposium on Distributed Objects and Applications (DOA 2004). October, 2004. S. Mohapatra and N. Venkatasubramanian. A Game Theoretic Approach for Power Aware Middleware. ACM/IFIP/USENIX 5th International Middleware Conference. October, 2004. V. Balasubramanian and N. Venkatasubramanian. GURU: A Multimedia Distance-Learning Framework for Users with Disabilities. Demo. ACM Multimedia. October, 2004. J. Wickramasuriya, M. Datt, S. Mehrotra and N. Venkatasubramanian. Privacy Protecting Data Collection in Media Spaces. ACM Multimedia. October, 2004. S. Gutierrez-Nolasco, N. Venkatasubramanian, M.-O. Stehr and C. Talcott. Exploring Adaptability of Secure Group Communication using Formal Prototyping Techniques. 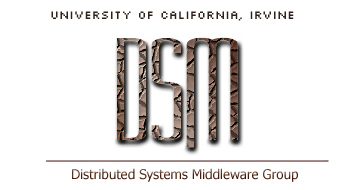 Proceedings of the 3rd Workshop on Adaptive and Reflective Middleware (Middleware 2004). October, 2004. M. Deshpande and N. Venkatasubramanian. The Different Dimensions of Dynamicity. The 4th International Conference on Peer-to-Peer Systems. July, 2004. S. Mehrotra, C. Butts, D. Kalashnikov, N. Venkatasubramanian, J. Wickramasuriya. CAMAS: A Citizen Awareness System for Crisis Mitigation. Demo. ACM SIGMOD. June, 2004. V. Balasubramanian, D. Massaguer and N. Venkatasubramanian. Adapting Multimedia Data for Users with Motor Impairments in GURU. Poster Paper, IEEE International Conference on Multimedia and Expo (ICME-2004). June, 2004. Q. Han, M. Nguyen, S. Irani and N. Venkatasubramanian. Time-sensitive Computation of Aggregate Function over Distributed Approximate Data. Proceedings of the 12th IEEE International Workshop on Parallel and Distributed Real-time Systems (WPDRTS). April, 2004. Q. Han, S. Mehrotra and N. Venkatasubramanian. Energy Efficient Data Collection in Distributed Sensor Environments. The 24th IEEE International Conference on Distributed Computing Systems (ICDCS). March, 2004. I. Lazaridis, Q. Han, X. Yu, S. Mehrotra, N. Venkatasubramanian, D. Kalashnikov and W. Yang. QUASAR: Quality Aware Sensing Architecture. ACM SIGMOD Record. March 2004. H. V. Antwerpen, N. Dutt, R. Gupta, S. Mohapatra, C. Periera, N. Venkatasubramanian and R. V. Vignau. Platforms and Tools for Energy-Efficient Design of Multimedia Systems. Design Automation and Test in Europe(DATE), March 2004. Q. Han, S. Gutierrez-Nolasco and N. Venkatasubramanian. Reflective Middleware for Integrating Network Monitoring with Adaptive Object Messaging. IEEE Network, Special issue on Middleware Technologies for Future Communications Networks. January-Februray, 2004. S. Mohapatra, C. Bell and N. Venkatasubramanian. Device Independent Remote Adaptations for Power Optimization using Distributed Middleware. Communication Networks and Distributed Systems Modeling and Simulation Conference, January, 2004. X. Yu, K. Niyogi, S. Mehrotra and N. Venkatasubramanian. Adaptive Target Tracking in Sensor Networks. Communication Networks and Distributed Systems Modeling and Simulation Conference, January, 2004. S. Mehrotra, C.T. Butts, D. Klashnikov and N. Venkatasubramanian et al. Project RESCUE: Challenges in Responding to the Unexpected. IS&T/SPIE International Conference on Internet Imaging, January 2004. S. Pasricha, S. Mohapatra, M. Luthra, N. Dutt and N. Venkatasubramanian. Co-optimization of Streaming Multimedia QOS and Backlight Power Consumption for Mobile Handheld Devices. Journal of the Korean Multimedia Society. December 2003. R. Cornea, S. Mohapatra, N. Dutt, A. Nicolau and N. Venkatasubramanian. Managing Cross-Layer Constraints for Interactive Mobile Multimedia. IEEE Workshop on Constraint-Aware Embedded Software. December, 2003. Y. Huang and N. Venkatasubramanian. Supporting Mobile Multimedia Services with Intermittently Available Grid Resources. International Conference on High Performance Computing (HiPC). December 2003. Q. Han and N. Venkatasubramanian. Addressing Timeliness/Accuracy/Cost Tradeoffs in Information Collection for Dynamic Environments. The 24th IEEE International Real-time Systems Symposium (RTSS). December, 2003. S. Mohapatra, R. Cornea, N. Dutt, A. Nicolau and N. Venkatasubramanian. Integrated Power Management for Video Streaming to Mobile Handheld Devices. ACM Multimedia ‘03 (Systems Track) (ACM SIGMM-03). November, 2003. S. Mohapatra and N. Venkatasubramanian. Proactive Energy-Aware Video Streaming to Mobile Handheld Devices. Fifth IEEE International Conference on Mobile and Wireless Communications Networks (MWCN 2003). October 2003. S. Pasricha, S. Mohapatra, M. Luthra, N. Dutt and N. Venkatasubramanian. Reducing Backlight Power Consumption for Streaming Video Applications on Mobile Handheld Devices. ACM/IEEE/IFIP Workshop on Embedded Systems for Real-Time Multimedia (ESTIMedia, CODES-ISSS 2003). October, 2003. R. Cornea, N. Dutt, R. Gupta, S. Mohapatra, A. Nicolau, C. Pereira, S. Shukla and N. Venkatasubramanian. ServiceFORGE: A Software Architecture for Power and Quality Aware Services. Workshop at the International FME Symposium. September, 2003. R. Cornea, S. Mohapatra, N. Dutt, A. Nicolau and N. Venkatasubramanian. Power-Aware Multimedia Streaming in Heterogenous Multi-User Environments. IFIP/IEEE International Workshop on Concurrent Information Processing and Computing (CIPC 2003). July, 2003. S. Gutierrez-Nolasco, A. Weitzenfeld and N. Venkatasubramanian. Controlling Mobile Robots with Distributed Neuro-Biological Systems. Proceedings of the 2nd Annual Symposium on Autonomous Intelligent Networks and Systems (AINS’03). July, 2003. Cornea, Mohapatra, Dutt, Gupta, Kreuger, Nicolau, Schmidt, Shukla and Venkatasubramanian. A Model-Based Approach to System Specification for Distributed Real-time and Embedded Systems. 9th IEEE Real-time/Embedded Technology and Applications Symposium Workshop on Model-Driven Embedded Systems, (RTAS 2003). May, 2003. S. Mohapatra and N. Venkatasubramanian. PARM: Power Aware Reconfigurable Middleware. IEEE International Conference on Distributed Computer Systems (ICDCS-23), May 2003. X. Yu, K. Niyogi, S. Mehrotra and N. Venkatasubramanian. Adaptive Middleware for Distributed Sensor Environments. Middleware2003 WiP paper, IEEE DS Online, Vol. 4, No.5, May 2003. V. Balasubramanian and N. Venkatasubramanian. Adapting a Multimedia Distance Learning Environment for Vision Impairments. ITCC, April, 2003. V. Balasubramanian and N. Venkatasubramanian. Server Transcoding of Multimedia Information for Cross Disability Access. ACM/SPIE Conference on Multimedia Computing and Networking (MMCN 2003). January, 2003. J. Wickramasuriya, Q. Han and N. Venkatasubramanian. A Directory-Based Approach to Distributed Systems Middleware. IEEE International Workshop on Object-Oriented Real-time Dependable Systems (WORDS 2003), January, 2003. N. Venkatasubramanian. Safe Composability of Middleware Services. Communications of the ACM. June 2002. Q. Han and N. Venkatasubramanian. Aggregation Based Information Collection for Mobile Environments. Journal of High Speed Networks, Vol. 11, No. 3-4, 2002. Y. Huang and N. Venkatasubramanian. Data Placement in Intermittently Available Environments. International Conference on High Performance Computing (HiPC). December, 2002. J. Wickramasuriya and N. Venkatasubramanian. A Middleware Approach to Access Control for Mobile Concurrent Objects. International Symposium on Distributed Objects and Applications (DOA 2002). October, 2002. S. Gutierrez-Nolasco and N. Venkatasubramanian. A Reflective Middleware Framework for Communication in Dynamic Environments. International Symposium on Distributed Objects and Applications (DOA’02). October, 2002. Q. Han and N. Venkatasubramanian. A Cost Driven Approach to Information Collection for Mobile Environments. The 4th IEEE International Conference on Mobile and Wireless Communications Networks (MWCN). September, 2002. Y. Huang and N. Venkatasubramanian. QoS-based Resource Discovery in Intermittently Available Environments. IEEE 11th High Performance Distributed Computing. July, 2002. S. Gutierrez-Nolasco and N. Venkatasubramanian. Reachability Snapshots in the Presence of Failures: An exercise in Protocol-Service Composition. International Conference on Dependable Systems and Networks, Workshop on Dependable Middleware-Based Systems, June 2002. S. Mohapatra and N. Venkatasubramanian. A Distributed Adaptive Scheduler for QoS Support in Compose|Q. Seventh IEEE International Workshop on Object-oriented Real-time Dependable Systems (WORDS 2002). January, 2002. Q. Han and N. Venkatasubramanian. AutoSeC: An Integrated Middleware Framework for Dynamic Service Brokering. Middleware WiP paper, IEEE Distributed Systems Online, Vol. 2, No.7. November, 2001. N. Venkatasubramanian and C. Talcott. A Semantic Framework for Modeling and Reasoning about Reflective Middleware. IEEE Distributed Systems Online, Vol. 2, No. 6. October, 2001. S. Irani and N. Venkatasubramanian. Semi-continuous Transmission in Cluster-Based Video Servers. IEEE International Conference on Cluster Computing (Cluster’2001). October, 2001. S. Gutierrez-Nolasco and N. Venkatasubramanian. Design Patterns for Safe Reflective Middleware. ACM OOPSLA Workshop on Patterns and Pattern Languages for OO Distributed Real-time and Embedded Systems, October 2001. X. Wei and N. Venkatasubramanian. Predictive Fault Tolerant Placement in Distributed Video Servers. IEEE ICME, August 2001. N. Venkatasubramanian, M. Deshpande, S. Mohapatra, S. Gutierrez-Nolasco and J. Wickramasuriya. Design and Implementation of a Composable Reflective Middleware Framework. IEEE International Conference on Distributed Computing Systems (ICDCS 2001). April, 2001. Z. Fu and N. Venkatasubramanian. Adaptive Parameter Collection in Dynamic Distributed Environments. IEEE International Conference on Distributed Computer Systems (ICDCS 2001). April, 2001. Z. Fu and N. Venkatasubramanian. Directory Based Composite Routing and Scheduling Policies for Dynamic Multimedia Environments. IEEE International Parallel and Distributed Processing Symposium (IPDPS). April, 2001. N. Venkatasubramanian, C. Talcott and G. Agha. A Formal Model for Reasoning about Adaptive QoS-Enabled Middleware. Formal Methods Europe (FME 2001). Humboldt-Universit zu Berlin, Germany. March, 2001. X. Wei and N. Venkatasubramanian. Services for Fault Tolerant Multimedia Applications. Short Paper. IFIP/ACM International Conference on Distributed Systems Platforms and Open Distributed Processing. 2000. N. Venkatasubramanian and C. Talcott. A Reflective Framework For Providing Safe QoS-enabled Customizable Middleware. IFIP/ACM Workshop on Reflective Middleware (RM2000). April, 2000. S. Gutierrez-Nolasco and N. Venkatasubramanian. A Composable Reflective Communication Framework. IFIP/ACM Workshop on Reflective Middleware (RM2000). April, 2000. N. Venkatasubramanian, G. Agha and C. Talcott. A MetaObject Framework for QoS-Based Distributed Resource Management. Third International Symposium on Computing in Object-Oriented Parallel Environments (ISCOPE’99). December, 1999. Z. Fu and N. Venkatasubramanian. Combined Path and Server Selection in Dynamic Multimedia Environments. ACM Multimedia. November, 1999. N. Venkatasubramanian and C. Talcott. A Semantic Framework for Specifying Composable Distributed Resource Management Activities. 14th IFIP International Workshop on Algebraic Development Techniques (WADT ‘99). September, 1999. N. Venkatasubramanian. ComPOSE|Q - A QoS-enabled Customizable Middleware Framework for Distributed Computing. IEEE International Conference on Distributed Computing Systems (ICDCS). Distributed Middleware Workshop. June, 1999. N. Venkatasubramanian, G. Agha and C. Talcott. Composable QoS Based Distributed Resource Management. Workshop on Compositional Software Architectures. Monterey, CA. January 1998. N. Venkatasubramanian and G. Agha. An Actor-Based Framework for Managing Multimedia QoS. Proceedings of Multimedia Information Systems Conference 1997(MISC’97). S. Ren, N. Venkatasubramanian, G. Agha. Formalizing QoS Constraints Using Actors. IFIP FMOODS, September 1997. N. Venkatasubramanian and S. Ramanathan. Load Management for Distributed Video Servers. IEEE ICDCS, May 1997. N. Venkatasubramanian and C. Talcott. Meta Architectures for Resource Management in Open Distributed Systems. ACM PODC, August 1995. P. Garg, A. Shepherd, S. Frolund and N. Venkatasubramanian. A Model Based Approach for Distributed Applications Stability Engineering. California Symposium on Software Engineering, 1994. N. Venkatasubramanian and C. Talcott. A Meta Architecture for Scalable Distributed Resource Management. HICSS, January 1993. N. Venkatasubramanian, G. Agha and C. Talcott. Scalable Distributed Garbage Collection for Systems of Active Objects. IFIP International Workshop on Memory Management, September 1992. N. Venkatasubramanian, G. Agha and C. Talcott. Scalable Concurrent Computing. Invited paper, Journal of The Indian Academy of Sciences, March 1992.